Nuno Severiano Teixeira is Full Professor at NOVA University–Lisbon, currently Visiting Professor at Georgetown University, and Director of the Portuguese Institute of International Relations. He was a Visiting Scholar at the Institute for European Studies, University of California, Berkeley (2004), and Senior Visiting Scholar at the Robert Schuman Centre for Advanced Studies European University Institute–Florence (2010). He served as Minister of Interior (2000/2002) and Minister of Defence (2006/2009) of the Portuguese Government. From war campaigns to peacekeeping operations, The Portuguese at War presents an overview of the conflicts, wars and revolutions in which Portugal was involved from the nineteenth century to the present day. From the French invasions to the civil wars, from the African Empire to the wars of decolonisation, from belligerence in the First World War to neutrality in the Second, from participation in the Atlantic Alliance to peacekeeping operations in Kosovo, East Timor, Lebanon and Afghanistan. The book addresses the military interventions in politics and the role of the country's political regimes in military reform: from the Liberal Revolutions to the Republic, from the military dictatorship and authoritarian regime to the 25th of April Revolution and the transition to democracy. The historical record of Portugal's war involvement is not only closely aligned to international and European circumstance but to internal factors: the economy, society, public opinion and political/military power. A historical perspective must of necessity link Portuguese war excursions with the military institutions in place at the time: their recruitment system, social composition and organisation of the army, navy and air force; the military ethos; the evolution of equipment, weapons and military technologies; strategic military doctrine and how this impacted on tactics and military operations; and of course the war outcomes. Special attention is given to the effects of international isolation after the Estado Novo, and post-Cold War europeanisation. The book does not eschew the plurality of interpretative theories. 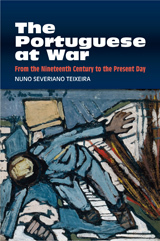 Rather, it seeks to combine historical accuracy of the Portuguese at war within a highly readable literary narrative aimed not only at undergraduate and research levels, but at a broader public audience interested in the complex reach and role of Portugal in world history. Independence movements and armed conflict: One or three decolonisation wars?